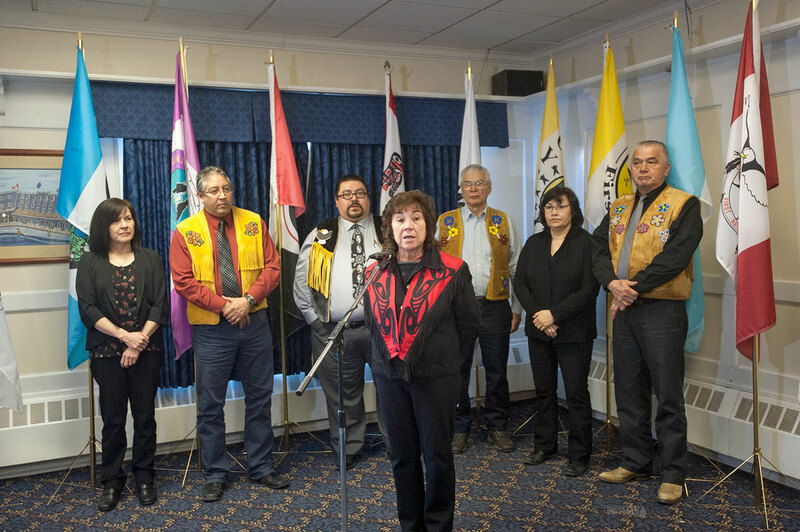 OPPOSITION FIRM – Grand Chief Ruth Massie of the Council of Yukon First Nations and other aboriginal leaders hold a press conference Monday to reaffirm their steadfast opposition to Bill S-6. In the background are, left to right: Deputy chief Millie Olson of the First Nation of Na-cho Nyak Dun, Chief Eric Fairclough of the Little Salmon-Carmacks First Nation, Chief Steve Smith of the Champagne and Aishihik First Nations, deputy chief Stanley Njootli Sr. Of the Vuntut Gwitchin First Nation, Chief Doris Bill of the Kwanlin Dun First Nation and Chief Carl Sidney of the Teslin Tlingit Council. First Nations leaders have flatly rejected an offer to sit down and discuss their concerns with Bill S-6 after it’s passed by the House of Commons. Premier Darrell Pasloski proposed a bilateral accord during his presentation Monday to the House of Commons committee to address First Nation issues with proposed amendments to the Yukon Environment and Socio-economic Assessment Act. The First Nations have promised they’ll take the federal government to court – and win – if the bill is approved with the four amendments they strongly oppose. In a joint press conference Monday, Grand Chief Ruth Massie of the Council of Yukon First Nations and several other chiefs maintained their position, as they had all indicated in their presentations to the seven committee members, including Yukon MP Ryan Leef. “I think if the premier was serious about it, we would have had these consultations before we came to this point,” Chief Eric Fairclough of the Little Salmon-Carmacks First Nation said at the press conference. “He is saying, ‘trust me, we are going to consult with you after this is passed,’ which is totally wrong. “Besides, I do not believe this premier is going to be around much longer,” said Fairclough, a former NDP and Liberal MLA for the Mayo-Tatchun riding. The chief said he is hopeful the Standing Committee on Aboriginal Affairs and Northern Development can come up with a solution to address the issues raised by the First Nations. The First Nation opposition to Bill S-6 is clear, and entrenched, and a promise to sit down and talk about those concerns after the bill is passed just doesn’t cut it, Fairclough indicated. The First Nations have accused the Yukon government of slipping in the four controversial amendments without consulting them, after the parties had agreed to more than 70 other amendments during the five-year review of the assessment act. The committee heard from more than 20 individuals Monday from all corners of the Yukon. It heard both support and opposition. There was a suggestion Bill S-6 should be withdrawn until the issues can be straightened out. A legal battle will only create greater uncertainty in the assessment process and the potential for investment in the territory, the committee heard. Massie, however, emphasized Yukon First Nations are very serious about resolving their issues with Bill S-6 outside the courts. Fairclough said the committee needs to examine the points made by First Nations during the hearings. “They have to take Yukon First Nations seriously,” he said. The territorial government has not taken their concerns seriously, he added. Fairclough said he is hopeful the standing committee can come up with something of a solution after hearing what the First Nations had to say. Asked if there is any division among First Nations on the issue, all chiefs quickly shook their heads, indicating no, there isn’t. Bill S-6 has already been passed by the Senate and has received second reading by the House of Commons. The First Nations and other organizations in the Yukon say the four controversial amendments will undermine and reduce the quality of the assessment process and take away from the independence of the assessment board. After the amendments surfaced last year in Bill S-6, the First Nations and others began a comprehensive public campaign detailing their opposition to the federal legislation. See story on chiefs’ remarks to committee. "Take our word for it"....they told that sawmill...remember? Even the Judge told them the Government word ain't worth s%#t. Hold back passing the changes or withdraw the four amendments to a later date. I have worked on land claims and the land claims was successful because everything was on the table up front and was dealt with in an open manner. Trying to add amendments that has not had proper discussion and solution is wrong. If you add amendments that changes the intent of the process such changing power of the process to a Minister totally removes the purpose of the process. The independent nature of the board is changed because a Minister can override the independent nature of the decision. If a Minister can order certain projects to not have to go through the process then the board has lost its purposes. Let the board have the powers to decide what projects have to go through the process because that is their job and have the staff to evaluate projects. My experience with the Yukon Government administration not the elected officials is the administration pushing this agenda because they want total control and think they know how best to manage the process. Passing amendments that a major part of our population does not agree with is wrong and not in the spirit of land claims and will just set back relationships with First Nation and undue all the good work that has been done over the years. Common sense will tell you, you don't pass something and then discuss it. There will be no meaningful discussion once the process is in place. Mr. Premier and Mr. MP you have to do what is right and step back on this one because if you don't your credibility is gone and the land claims will come to a legal challenge for First Nations. Please reconsider the other peoples understanding of the situation! Premier Pasloski said he hoped everyone could work together on this issue, looks like he is getting some to work together.